After completing installation of the air cleaner, battery, and seat, it was time to test my work. I checked the tire pressure, and was surprised to find them still holding air. Not sure if 40-year old tubes are safe for road use, but they should be fine for my backyard test run. I fired the bike up after a few kicks, and hooked up my timing light to use its tachometer feature. The shop manual specifies a base idle of 1200 RPM, but it seemed to have a tendency to stall, so I aimed for 1500. I fiddled around with the two adjustment screws for a few minutes, then found what felt like a sweet spot. Eager to test the bike, I decide to leave finer adjustments for later. I’ve never ridden a motorcycle, and it’s been a long time since I was on a bicycle. So for this test run, I kept it in first gear the entire time. I want to say that I was going at speeds of up to 15-20 MPH, but I can’t be sure because this test run revealed another issue: neither the odometer nor the speedometer are functioning. While I managed to stay upright, I did stall it a few times. I still need to work on what I like to call “panic mode”, which should involve clutching and braking. Unfortunately, my muscle memory keeps telling me to use my feet to stop, and they’re completely unprepared to bring the weight of a motorcycle to halt. I need to work on my weight shifting, too. I’m not used to leaning my body into turns while trusting the wheel grip to keep me from falling over. And since my right wrist needs to manipulate the throttle, bracing myself against the handlebars is tricky. Lots of things to practice before my riding skills are road-worthy. But my practice soon came to an end, because after about 15-20 minutes of riding around the backyard, I couldn’t get it restarted after another stall event, and had to put it in neutral for the “walk of shame” back to the garage. There I fiddled around with the air screw and the throttle stop screw some more, trying to find that sweet spot again, but it seems to have developed a new symptom. 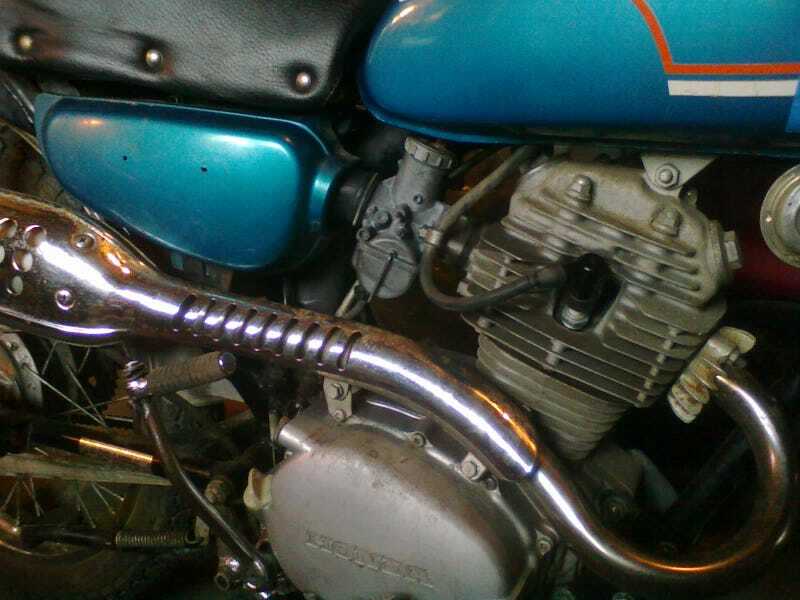 Once started, the bike will not idle without throttle application. I reconnected my timing tach, and found that I am having a hard time keeping it under 3000 RPM. With the throttle closed, the engine suddenly tries to surge up to somewhere around 7000 RPM or more, and when I adjust the throttle stop screw to bring it back down, it falls on its face. I try to catch it by opening the throttle, which despite my attempts to make the smallest of motions with the handle, surges the engine way back up again. The engine will not maintain a steady speed. According to the shop manual, the idle stop screw is supposed to be adjusted for 1200 RPM, and the air screw is supposed to be turned to whatever offers the highest RPM. Aside from that, the book is disappointingly lacking except for a poorly-worded float adjustment procedure. There are some other things that I can tell are adjustable (like the position of the clip on the jet needle), but the book does not mention. So I just put it back together the way I found it. I found this chart in the shop manual, which might have the information I’m looking for, but I can’t decipher it. The only part of this chart that I understand is the 24mm “fuel level” (float adjustment).